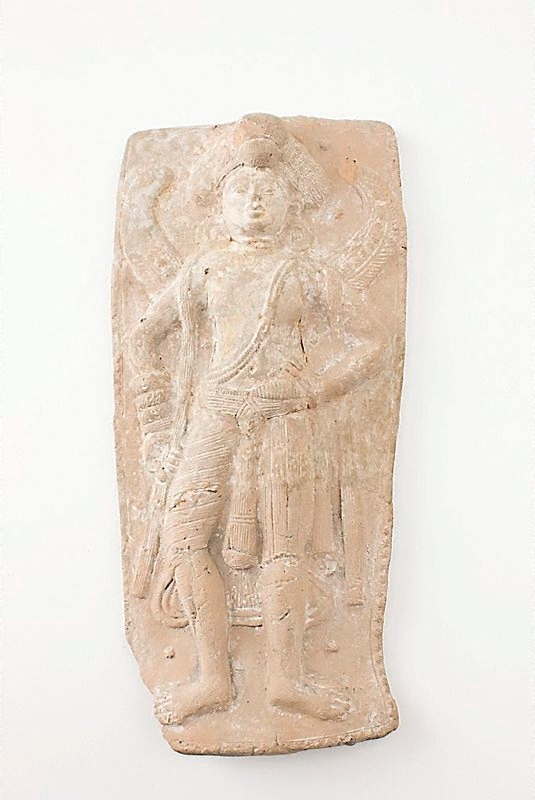 This plaque depicting a standing male figure is possibly a representation of a winged deity, perhaps a gandharva, associated with fertility, marriage and the protection of virgins. He is depicted as an upright figure with a round face, wide eyes and full lips. He wears a distinctive and heavy turban, large wheel-like earrings, bangles on his proper right arm and an elaborately woven lower garment belted with a sash. The sophisticated dress of this richly dressed figure reflects the burgeoning wealth of a very early urban and middle-class society who now had money to spend on art objects and architectural decoration. It would seem that such plaques were made to be hung on a wall, perhaps in a temple.